I’d been debating for a while weather or not I should wear one of these badges, for those outside of London, you can get them from TFL (who run the tubes, buses etc.) and wear them to let other travellers know you are pregnant and would like a seat. Last time round I didn’t get one, not many people had them and I could walk to work for most of my pregnancy anyway. By the time I couldn’t it really should have been pretty obvious! This time I’ve given it a bit more thought. 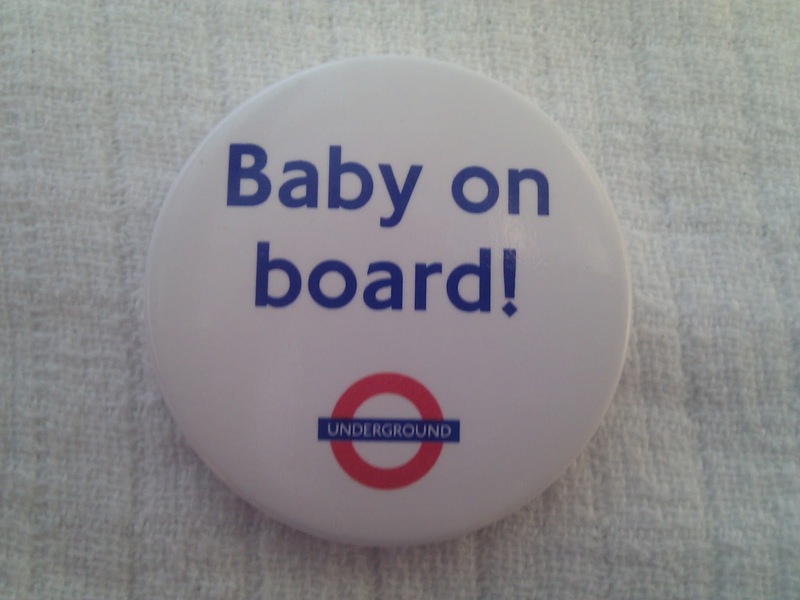 I agree that the badges are a good idea, I’d like to assume that most people, even in London, are decent human beings who would give up their seat for a pregnant woman but that those same kind souls would be mortified if they offered a seat to a “pregnant lady” only to find they’d made a fat girl cry! So for those awkward in between months the badge removes doubt – kind persons offers seat, pregnant person gratefully accepts it. 1- How embarrassing is it going to be standing there, pregnancy branded and still not offered a seat? 2- What if I’m actually ok standing? The second trimester may be fine. Actually I could have done with a seat more when I busted my knee doing martial arts but there are no – “Jitsu Accident On Board” badges, what if others actually need it more than me? 3- The points I’m most likely to need a seat are when I’m huge and a badge really shouldn’t be necessary or in the exhausted, nauseas first trimester when I didn’t dare wear one for fear of bumping into colleagues. I really hadn’t made up my mind until I almost fainted in the staff canteen last week and was packed off to hospital. As a result of this I’ve been told that my blood pressure is a bit low and drops when I stand so apparently fainting is to be expected. With that in mind I decided that however embarrassed I may be to wear a badge, even given all the doubts above, it’ll be a whole lot better than flopping face first into the lap of an unsuspecting commuter. Or give me your comments – what do you think of these badges? Have you used one – and if so how did people react? Wednesday morning rush hour, train full on arrival at my station – Not offered a seat when I got on, no one in “priority seats” even bothered to look up, but at the next stop I had to move to the end of the carriage where a nice lady kindly bashed her husband repeatedly until he offered me his seat. I’ll call that a badge success. Previous: Previous post: #R2BC – A Pump, a Bump and a Rump! I used a badge in my last pregnancy and found it very useful. There are plenty of people who are happy to give up their seat, but are sometimes worried about offering it to a “fat” lady instead of a pregnant one. The badge removes the element of doubt. The few times i've been into London this time round I've worn it and found it equally useful. I too am suffering from low BP this pregnancy and sometimes I just really need to sit down! Is there a similar badge for disabled people (especially those with mobility aids)? Sorry Stephanie – for some reason your comment went to be moderated – but didn't tell me that so I've only just seen it! As far as I know there aren't similar badges for disabled people, one would hope that especially if you have a mobility aid would be enough to make people take notice but sadly I know that isn't always the case. In the past I've been put in the position of being the heavily pregnant lady offering her seat to someone on crutches because no one else could be bothered!